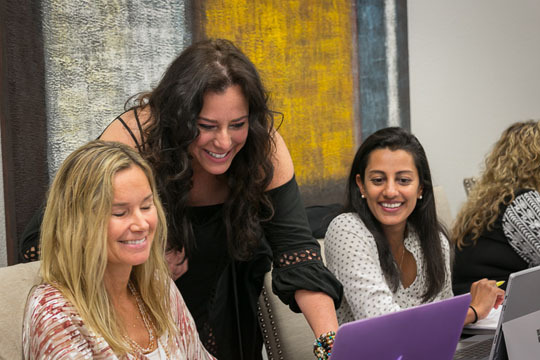 At The Academy of Interior Design, our friendly team specializes in helping aspiring designers turn their creative passions into a thriving career. 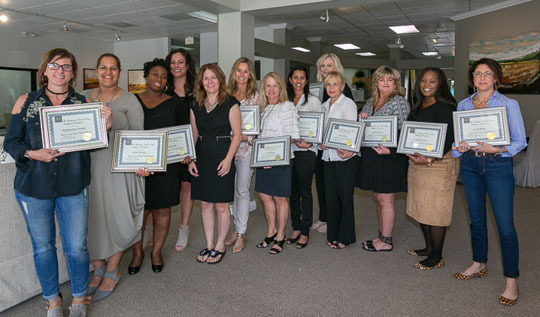 This interior design training has an exceptional certificate program built around a core 5-day intensive course. The 5-day format is ideal to accommodate out-of-town designers and anyone else looking to start or re-establish their design career. We truly care about your success and want to hear about your goals and aspirations so we can support them with personalized instruction and real-world examples. You will leave our classroom feeling fully prepared and confident to start designing right away. We feel so strongly about your success that we even include 6-months post graduate business development support. This complete interior design course includes hands-on training with full mock design projects and business planning you need to start or expand your interior design business. You will follow an easy, step-by-step process that teaches you to think like a pro designer, set up a design business using proven tools, and earn great money doing the creative work you love. Our team truly cares about your professional development and our classes are engaging, informative, and teach you the critical skills needed to succeed in this exciting field. A multitude of industry experts will be sharing their skills and knowledge, so you too can consistently wow clients and build a stellar design career. Our mission at the Academy of Interior Design is to give you the solid foundation you need to succeed as an Interior Designer. With decades of design experience, we know exactly what works, and what doesn’t in the real world. More importantly, we know how to expedite your training. Over the course of 5 days we will lead you through a series of unique exercises that teach you the most critical design skills as fast as possible -- the same skills that help us impress clients and command high fees every day. You’ll also receive comprehensive business training and client materials that will set you apart from the competition and empower you to launch your Interior Design business right away. As an Academy of Interior Design graduate, you’ll be fully supported for a full 6 months with 1-on-1 business coaching and design mentoring by seasoned Interior Design professionals from our inner circle – and don’t worry, it doesn’t end there. You have the option to continue on in the mentoring program for as long as you like. It’s just one of the many things that sets us apart from other programs and ensures you achieve the most success in your new career. Interior design aesthetics, discounts, resources, mark-ups, valuable insider industry information. Several hands-on mock projects in the classroom. LA Mart Design Showroom tour with featured showroom speakers and demos. Meet and Greet with trade-only sales reps and vendors. HGTV/TLC television producers panel discusses how to attract media attention to your new business. At The Academy, our exclusive, interactive system gives you the knowledge and tools to talk with clients, plan interiors and grow a thriving design business. We've condensed many years of experience and skill into an easy process that transfers our teams pro design skills to you, taking you from novice to expert in a short time. The 5-day intensive is the heart of your comprehensive design education. In addition to learning critical design skills, you’ll receive all the business and marketing guidance, and templates, you need to get started right away. This is a full Interior Design Certificate course that gives you even more depth than the best programs out there but condensed into a single intensive hands-on week combined with an introductory pre-study week and 6 months of personal coaching and mentoring plus full business creation and marketing guidance. To get you started fast, we break even the most complex topics -- like full design projects -- into simple processes that are easy to follow and easy to master. (This is the insider training we wish we had as aspiring designers!) These systems will save you time and money, and prepare you for real financial success and fulfillment as an Interior Designer. You’ll also learn insider design techniques and tricks that save time, impress clients and lead to bigger paydays for you. For example, I’ll share the intuitive apps and software pro’s use to find inspiration, collaborate with vendors and source trade-only products in minutes instead of days. I’ll also show you how to outsource specialty design services like AutoCAD and elevation drawings -- at a profit -- so you can earn more money and free your time to do what you do best. You will also have all the design business essentials you need, like easy formulas, pricing strategies and mark-up guides, simplified forms and contracts, insurance guidance, step-by-step design guides, client documents and materials. It’s like a complete Interior Design career in a box. With our exclusive 6-step Design-Pro system, our team is with you every step of the way. As an Academy of Interior Design student, you’ll be on the inside -- with Wanda and other industry leaders -- learning alongside fellow Interior Design leaders of tomorrow. What if you could land your first paying client next week? What if you could have your own Interior Design television show? What if your dream of being an Interior Designer were only a phone call away? Take the first step today and join me in the Interior Design training program at the Academy of Interior Design. I’m so excited to help you launch your new career!